Wirt H. Gammon, Jr., a longtime sports writer for the Chattanooga Times, has died at the age of 84. He had followed his father's profession. Wirt Gammon Sr. had worked as a sports writer or editor at the Chattanooga Times from 1930 until the mid-1970s. He then continued writing a column once a week until shortly before his death in 1985. Wirt Gammon Jr. grew up in North Chattanooga and graduated from Normal Park School, North Side Junior High and Chattanooga High. He was a graduate of the University of Chattanooga, where he majored in English and minored in Languages. He was also a member of the Varsity Tennis Team. He served in the U. S. Army after World War II and was stationed in Europe as a language translator. Wirt Gammon Jr. was a sports writer for the Chattanooga Times for 20 years during which time he spent a decade as a SEC Skywriter, representing the Chattanooga Times on preseason football tours around the Southeastern Conference. “I grew up reading the sports page because my father had a column in there every day,” he told John Shearer in an interview. As a youngster, he traveled with his father to occasional Tennessee football games, including the Orange Bowl loss to Rice in Miami after the 1946 season. He also went to the Lookouts’ spring training in Florida one year. When he went to work for the Times in 1966, he initially covered and helped coordinate the coverage of high school sports. Then, in 1972, the Tennessee football beat became available. Jay Searcy, who was offered the position, preferred writing columns and did not want to be tied down to just one sport or team. So, Wirt Gammon Jr. became the UT football beat writer and held the position for 14 years. During that time, Coach Bill Battle’s teams began a slow, downward slide, forcing him to resign after the 1976 season. Former star tailback Johnny Majors was then hired, but he needed several seasons to get the program winning again consistently. Among his highlights of covering Tennessee was in 1982, when the Vols beat Alabama for the first time since 1970 and the students tore down the goal posts at Neyland Stadium. During his tenure, Gammon became acquainted with a number of the coaches and players. Joe Avezzano was on the staff of some of Johnny Majors’ early teams at Tennessee, and Gammon remembered seeing him later on television as a special teams coach with the Dallas Cowboys. Gammon’s last game covering UT was one of the most memorable for Big Orange fans – the 35-7 upset victory over Miami in the Sugar Bowl after the 1985 season. During his retirement, he received a certificate from Chattanooga State in landscaping and turf management. He worked at Home & Lawn Care and volunteered at Reflection Riding working with native plants. Gammon served as scorekeeper for the Chattanooga Lookouts for many years. 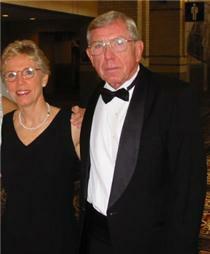 He was a member of the Greater Chattanooga Sports Hall of Fame and served on the board of drectors as their treasurer. He is survived by his sister Ann (Brad) Weeks, Lookout Mountain; nieces Sarah (Peter) Robbins, Chattanooga; Brooke Weeks (Lee Pike), Portland Oregon; great niece and nephews Maggie and William Robbins and Max Pike. Visitation will be on Friday, February 15, 2019 at 10 a.m. and a Celebration of Life Service will be held at 11 a.m. at St. Peter’s Episcopal Church, 848 Ashland Terrace, the Rev. Quinn Parman and the Rev. John Rouser officiating. In lieu of flowers, a memorial contribution may be made to the Chattanooga Sports Hall of Fame, 952 Wyndsor Drive, Hixson, TN 37343 or St. Peter’s Episcopal Church, 848 Ashland Terrace, Chattanooga, TN 37415 for the Clergy’s discretionary funds. Arrangements are by Hamilton Funeral Home and Cremation Services.